Distribution: The white-faced ibis occurs in California as an uncommon, localized breeder and summer resident. It nests in scattered locations in the San Joaquin Valley, and in recent years it has established breeding colonies in the Sacramento Valley. Until 2002, the white-faced ibis visited the Natomas Basin only in the summer, and the nearest recorded breeding occurrence was in Yolo County. 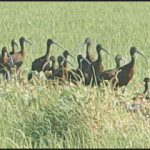 Since then, numbers of the white-faced ibis have increased in the basin, and a breeding colony has nested successfully at the Betts-Kismat-Silva tract in the Central Basin Preserve every year since 2007. In 2010, approximately 2,500 pairs of ibises were recorded nesting at this site. 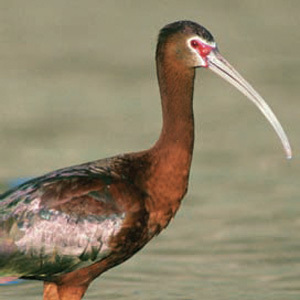 Habitat Requirements: The white-faced ibis depends on shallow, emergent wetlands with high quality fresh water. Wet meadows, irrigated pasture, flooded pond edges, and wet cropland such as rice fields can be suitable foraging habitat. For nesting, ibises typically use large emergent wetlands with islands of dense emergent vegetation. 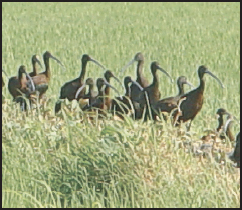 Reproduction and Demography: The white-faced ibis is a colonial breeder and builds a shallow nest in thick emergent vegetation such as tule and cattail, in shrubs, or in low trees. Both parents incubate the two to five eggs, which hatch in 17″“26 days. Significant breeding colonies have been reported in the Mendota Wildlife Area and the Colusa National Wildlife Refuge. Movement: The white-faced ibis is a species with high mobility and shifting ranges, with movements often coinciding with changing water levels and water quality. In late summer, individuals from North American nesting grounds disperse far beyond their breeding ranges. The winter range of the ibis is predominantly coastal Louisiana and Texas south to Mexico, but some winter groups occur locally in southern and northcentral California, particularly around Los Banos in Merced County. There is some indication that the white-faced ibises breeding in California are actually resident populations, but more research is needed. White-faced ibises have been observed traveling up to 25 miles (40 kilometers) between nesting and foraging grounds. Ecological Relationships: The diet of the white-faced ibis consists of aquatic or humid-soil invertebrates, crustaceans, frogs, and fishes. Predators of the white-faced ibis include skunks, coyotes, and raptors such as peregrine falcons and red-tailed hawks. Ibis chicks may be vulnerable to predators like gulls and night herons.